The developers of a 104-unit apartment complex in Harrison have sold the property about a year after opening in the growing transit hub community, brokerage firm HFF said Tuesday. In a news release, the firm said it represented The Hampshire Cos. and CrownPoint Development Group Inc. in the sale of 221 Bergen, a boutique property made up of two 52-unit buildings. The buyer, TAK Group, purchased the asset free and clear of existing debt. The luxury property, which opened its doors last fall, offers market-rate units with high-end finishes and amenities such as a rooftop terrace, resident lounge, remote-operated garage parking. It sits on a 1.48-acre site at 221 Bergen St. in Harrison’s waterfront redevelopment area, a former industrial section of the town that is anchored by a PATH station with access to Manhattan. Circle Squared Alternative Investments served as project investment adviser. “221 Bergen was a great opportunity and provided the perfect mix of location, quality and demand to make this a highly successful project,” said Jeffrey Sica, founder and president of Circle Squared Alternative Investments. 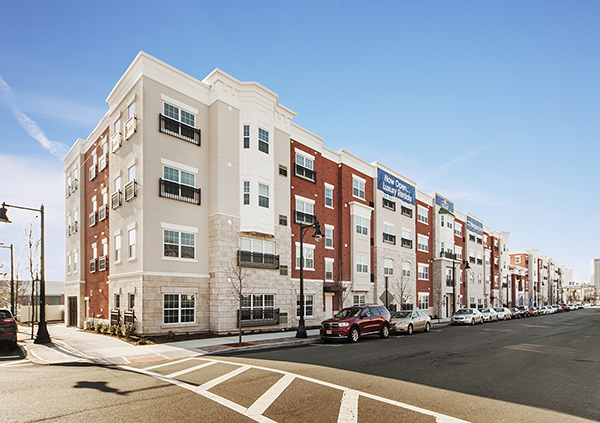 “Partnering with experienced developers such as The Hampshire Cos. and CrownPoint Group turned an opportunity into a tremendously successful community beating delivery timelines in every phase from construction through leasing and disposition of the asset.